One of the most simple, but powerful strategies to prevent yourself from overeating, gaining weight and then regretting what you’ve done is to Delay, Distract and Detach. Almost anyone (even your kids, under your guidance) can master this process. And always, an hour or two later and the next morning, you’ll feel so relieved that you didn’t cave into your cravings! I first learned the magic of Delaying, Distracting and Detaching in 1998 when I kicked sweets and simple carbs on doctor’s orders. I used this remarkable technique again in 2012 when I got Crazy Cravings after the death of my mother. And to this day, I love this powerful process, because it’s so super-simple, effortless and darn effective. 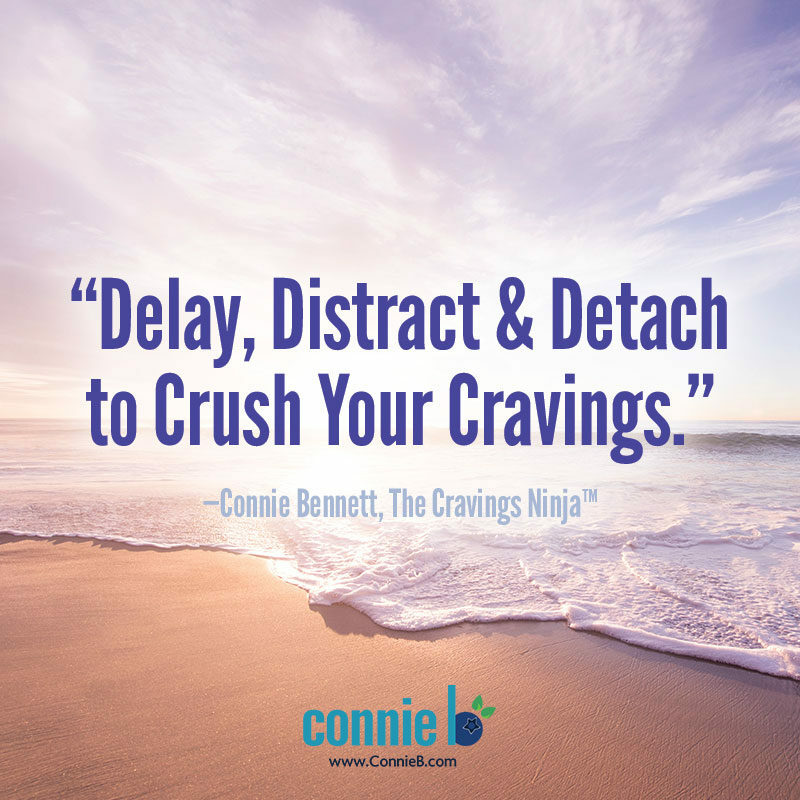 Now discover 7 ways this Delay, Distract, Detach Strategy can become your remarkable ally to pull the plug on your cravings. When that bag of cookies or chips calls out to you, first delay and distract for 5 minutes, then 10 minutes. Soon, you’ll be able to detach from your craving and realize that you really don’t want to stuff your face with cookies or chips; you’d much rather lose weight. Think about how doing nothing will make you powerful and in control. While you Delay, Distract and Detach, realize that you’re taking positive, health-promoting action by taking simple inaction. Talk about a great time to do chores around the house or office! When you Delay and Distract for 5 to 15 minutes, you can Detach while you wash the dishes, hang up clothes in your closet or organize papers on your desk. This simple Delay, Distract, Detach Process invites you to get in touch with your true feelings. What the heck is really going on that makes these quickie carbs so tantalizing to you? Are you stressed out, angry, nervous, hormonal or sad? Remember that this easy simple Delay, Distract, Detach Process will help you take back your power and take pride in yourself within minutes! You’ll be so glad that you put off a short-lived, self-defeating, immediate gratification in favor of a long-term positive outcome. Trust me, it’s really exciting and exhilarating to feel in control of your cravings! Now learn how to Delay, Distract and Detach. It’s time to Delay, Distract and Detach. The next time you hanker for cookies, crackers or chips, remind yourself that you have the willpower to delay for 5 minutes. If you still feel cravings, then delay and distract yourself for another 5 minutes. Go for a walk, do the dishes or call a friend. Organize papers on your desk, clean your kitchen, do some stretches. Or watch an 18-minute TED Talk. Ask yourself what you really need. Water, protein, fat? Me time? Exercise? Think about how great you’ll feel that you did not cave into your cravings. To stay focused, spend 5 or 10 minutes writing about what’s really bugging you. If need be, repeat the process again for another 5 minutes. You can do this over and over again until your cravings subsides, but it generally goes away within 5 to 15 minutes. I hope you’ll find this powerful process as amazing as I and Sugar Kickers around the world have. Tell your friends and loved ones about this powerful Delay, Distract and Detach Process. buy generic viagra now Get Your FREE download now to Crush Your Cravings, starting today. over the counter viagra This fun, fascinating, science-based, Cravings-Crushing, Quick-Start Guide will click here whisk you away from temptation for sugary, salty, fatty junk non-foods and and into the glorious, delicious, liberating world of self-control. I have lost over 100 pounds. I do not add sugar to anything, I do not use flour and I use very little salt. But all of a sudden I m starting to crave things like cookies, or crackers, bread. I cut my bread down to once a week two slices 12 wholegrain wheat. I eat once a week two flour tortillas. And I have tried to not think, avoid the food, grab a fruit, drink lots of water. I am beginning to think I will be gaining weight back.. I read labels…sugar grams has to be under 7gm. And if it takes flour I dont use it or I make like cauliflower pizza etc..Can you help me? Good for you, Ezzjeg! That’s so awesome! Wow! Impressive that you’ve lost 100 pounds!! Sorry I didn’t write back sooner. I was at a conference and didn’t see this. Just limiting grams of sugar may not be enough. Also, when you eat fruit, do you have protein with it?